Please look carefully at the suture lines and you will see that they are not aligned. Disclaimer: This is not meant as a diagnosis or treatment and is not intended to replace your normal Veterinary care. When a horse is tied and pulls back on the lead rope, they usually throw their head straight back at a fast rate. Followed by a struggle and usually results in pulling and leaning to one side in an attempt to free themselves. During this action, the halter catches at poll applying great pressure on the Occipital Nerve. Further impact pushes downward on the top of the skull compressing forward the Parietal Bone, which is the upper section that forms the skull. This might compress the brain cavity and the Hypothalamus, which is responsible for hormone production to govern the body and stabilizes blood sugar. Level III class teaches Cranial Sacral practitioners how to use energy to help the bones decompress. Could your horse be carrying a burden? That does not mean the rider! Horses and Ponies are similar to humans; they can store for years, buried deep within, the effects of past traumas, injuries, and bad memories; which should have been processed and either released, or integrated at the time, but were instead ‘shelved’ whilst the initial recovery took place. After time these can become, and remain locked in; thereby preventing the horse from becoming free again and moving on. Just another of the many benefits of Equine CranioSacral Therapy is that it can reconnect the horse with its own natural process of allowing the gentle unwinding and release of what needs to go. Relief! The equine Skull is made up of 26 individual plates of bone – These are joined together by Sutures, which act like joints between the Cranial bones, and are designed to help disperse the energy from an impact to the Skull. All bone is healthy living tissue, and has both a blood supply and a fatty tissue, giving it a degree of natural pliability. The bones may become jammed as a result of head trauma which can lead to neurological conditions. CranioSacral Therapy for horses focuses on restoring balance throughout this structure and the rest of the body. The photograph below of part of the skull of a young horse shows that the plates are not fused together and are naturally pliable. A newborn foal has a Skull which is made up of even more individual plates, and continues developing to the age of 5 – 6 years. Any significant external pressures, like pull backs or compression from trauma, on a young horse’s Skull will result in deep, long term and long lasting effects – If left untreated, this can result in behavioral issues, spookiness, TMJ issues, collection problems and other difficulties in work – to name just a few. The methods that April has taught me are amazing. The way the horses head can and does actually change shape afterwards is fascinating. Sometimes clients have been looking when we’ve been doing the work and have actually seen the face bones moving at that time. All brilliant stuff April has developed. Originally known as Craniosteopathy back in the early 1900’s, Craniosacral evolved from the practice of Osteopathy when Dr William Sutherland, an Osteopath, discovered that the bones of the Cranium connect to the bones of the Sacrum through what he referred to as the Core Link. consisting of the Skull, or Cranium, the Spinal Cord together with its protective sleeve called the Dura Matter, and finally the Sacrum. He further observed that when pressures were applied to the various parts of the head (Skull) – the Sacrum and Pelvis were affected via the resultant Cranial Wave; the same principle applied when light pressures were applied to the Sacrum, and then the bones of the Skull were affected also by the Cranial Wave. These structures are connected by Muscles, Fascia (tissue that weaves the whole body together like a spider’s web). Ligaments, and Tendons on the outside, but also very importantly, by the Tissues from inside the Core Link. Whilst traditional Osteopathy focuses on the bones themselves, Craniosacral focuses on bringing balance throughout the skeletal and muscular systems; with specific focus on the individual bones of the Skull, Spine, and Sacrum. Practitioners will first assess a horse’s movements, posture, and soft tissue; then will place highly sensitive hand and finger pressure to specific points, which may be anywhere on the horse’s body, to suit the individual needs of each horse at that particular moment and time. Whilst specific attention is given to the Cranium, and Sacrum; treatment is not limited to these areas due to how the body is connected. Issue: Equine recurrent uveitis (ERU) amongst other issues! Story: I bought Phoebe as a yearling, in Winter 2009. Her first ERU attack was the following Winter. At first it appeared to just be that she had something in her eye, and the vet diagnosed conjunctivitis and gave me some steroid drops to give her. Over the following 3 years she had 6 more attacks, each getting progressively worse and more aggressive. Her eye would completely close over, weep intensely and her pupil would constrict so much. I knew she was in agony. I was told by the vet the disease was progressive and that she would eventually lose the sight in that eye. She had a particularly bad attack following dental treatment(more stress to cranial bones as I have now learned) in June 2012. The vet then told me to consider either putting a cyclosporine implant in (which would continually release steroids for 3 years) or enunculation, remove the eye. My insurance ran out at the end of June 2012 so my options were limited and time was tight. As my good luck would have it April Battles was due to visit the UK in July 2012, so I got one of April’s ‘distance readings’ done in preparation of work to do before she got here. April stated we had many layers to peel off to bring Phoebe back to health and wellness. April’s reading said Phoebe had bacteria, and a virus, and needed intensive cranial work due to a head trauma, among other things. I also contacted a homeopathic vet for some local help. 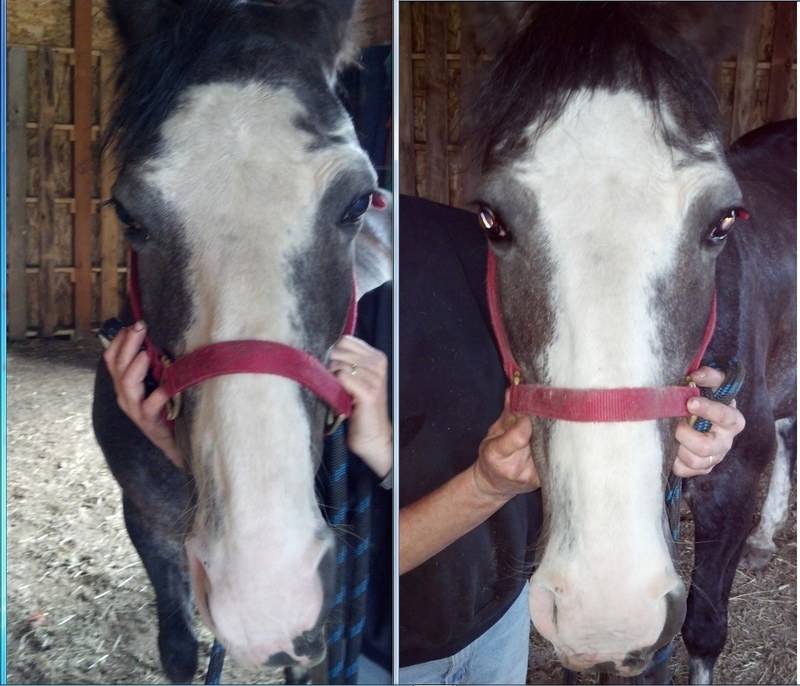 April came over in July and performed some intensive cranial work on her, and said to use diluted NCD in the eye to detox it, and colloidal silver and diatomaceous earth to get the other various problems resolved. The photos below show phoebes eye recovering from her last attack which is now over 6 months ago (June 2012); the longest she has EVER gone in between uveitis episodes, and a photo showing phoebes eye now, in December 2012. I have come to realize that the disease itself is not progressive, it is the conventional treatment with steroids which weakens the eye over time, making it more susceptible to future attacks. 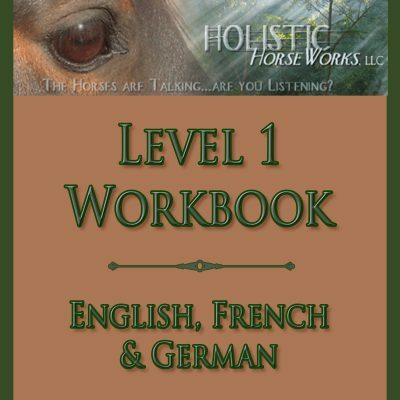 April is like a medical intuitive for horse’s and her knowledge of finding ‘dis-ease’ in the horse’s body has been instrumental in getting to the root of the problem, rather than conventional treatment which only treats the symptoms. Her passion to help me and my horse went far beyond my expectations. Phoebe and I are looking forward to seeing April again when she comes back to the UK in May 2013. I hope that my story will give others hope when faced with such decisions when dealing with this potentially heartbreaking disease. I was told my 4 yr old horse had to have her eye removed. Now My Vet is not saying the eye has to be removed. How amazing is that? 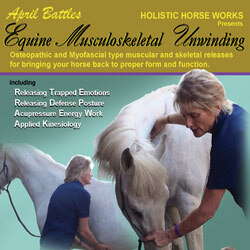 I have developed very effective equine cranial sacral therapy energy handholds! April says, “I have also found something that helped my horses, it’s called Natural Cellular Defence (NCD2). It is one of the few detoxes that has been proven to pass the blood brain barrier.” NCD2 can be ordered at www.myncd.com/590420 click on your country. Ships in the United States, Canada and the Netherlands. The energies applied, and also activated internally at CranioSacral therapy for horses, work to heal, release stresses, and stored trauma; also to release restrictions in the Musculoskeletal system, and in the Fascia, a tissue that weaves the whole body together like a spiders web. There is no physical manipulation to the bones and tissue. Positive physical reactions are frequently exhibited in a variety of forms by a horse and sometimes by their owners also! This can happen both during and after a session. A powerful, though gentle, mainly hands-on, healing practice, CranioSacral therapy for horses can be highly effective in the treatment of many injuries and conditions in horses and ponies; including behavioral and psychological problems. ECS is unique – as it focuses on (but is not limited to) the Equine Cranium, Spinal Cord, and Sacrum; their relationship to each other – and their effects on the rest of the body. Most horses can benefit from Equine CranioSacral therapy; especially as all will experience regular pressures and stresses throughout their lives -These can be from ‘every day’ items such as tight fitting nose bands, pressures from bits, incorrectly fitting tack, as well as field accidents, injuries, and the like. If there were any one single reason to use CranioSacral therapy for horses – It would have to be after Dental work. Dentistry is a very important and necessary component of equine health, and should be regularly carried out by a qualified professional. The Speculum (as shown) together with hand tools and sometimes power tools, are all required for dental procedures to be carried out as efficiently and safely as possible. However, the horse’s reactions to having the mouth held open in such an unnatural position (especially when under sedation), and also the actual work itself can lead to unhealthy pressures being put onto the bones of the skull and muscles of the TMJ; with inevitable consequences – such as compensatory patterns in mastication (chewing) – leading on to many other issues, and even sometimes the need for more Dentistry.